Bring up poor performance when it happens or smile and let it go. Don’t keep filling buckets with muck to throw later. Delay isn’t compassion, when it comes to feedback. It may be cowardice. #1. You validate poor performance when you don’t bring it up. Team members feel like they’re doing OK. You feel like you’re being kind. Neither is true. #2. You dig up the past to justify negative feedback, when you finally speak it. The danger of not bringing up poor performance – when it happens – is bringing up a history of falling short. #3. Employees feel blindsided and discouraged when you throw buckets of muck instead of giving timely feedback on one issue. Delay is cruel, not kind. Patience is giving people space to develop known deficiencies, not silence when they fall short. You aren’t being patient if you’re filling buckets with muck to throw later. In order to be patient with teammates, they must be working to improve known deficiencies. #1. Create a culture of pressing toward excellence. Discuss the pursuit of excellence at team meetings. Make developmental goals public. “I’m working on a weekly gratitude walk,” for example. Discuss ways to give timely feedback to each other. Commit to seeking and giving timely feedback. It’s one thing to discuss. It’s another to commit. Give feedback on giving feedback. Transparency with weaknesses is permission to bring up poor performance. How might leaders develop their ability to bring up poor performance? What must be true of leaders if they commit to bringing up poor performance when it happens? Headed into some of these performance related conversations this morning so this post was very timely. Being busy is not an excuse for non-performance. Truth spoken here! This post should be “nailed to the office wall” of every person charged with evaluating / appraising / improving the performance of others. Anyone who manages others should take note of this. I have been the receiver of feedback based on something that happened 6-9, or even 11.5 months ago. I often couldn’t even remember the ONE time that something particular happened!!. I vowed to speak up about performance issues quickly, long ago… A quick conversation helps to point out the issue and often gives a manager insight into that person and their view of the issue. Often, one may not ever realize what you are doing is ‘incorrect’, or considered poor. Bringing up poor performance isn’t easy. Leaders would do well to have a relationship with their reports. Getting feedback is much easier from someone you know has your best interest in mind. I would also offer that bringing a suggestion for improvement to the discussion is a helpful move, and shows your dedication to helping, rather than just throwing muck! I love # 1 – 1. Discuss the pursuit of excellence at team meetings. This is so important!! That way everyone can be on board with that pursuit. I was once in a meeting where the CEO said ‘we are all so very busy, and in order to help profits, we’re going to have to accept that “B” work is okay. NO, “WE” are not going to accept that, I strive for “A” work and empower those who work with me to do the same! Thanks Sandy. Your suggestions are so helpful. Successful managers are great supporters. Negative feedback without a commitment to support others is just a kick in the gut. It does more damage than good. Wow, Dan! Your visuals always support your posts’ themes, but today’s visual REALLY makes the theme pop! Your posts are timely and informative – whenever I am mulling over thoughts or problems, your post of the day seems to address exactly that problem. Sometimes I can’t choose what I like best – the words or the accompanying visual. Thanks! and Keep up your excellent work! So right on sir! When I first started supervising I was afraid of confrontation. I have learned that you can plan and use confrontation in a positive way. What people call confrontation is just good leadership. A good leader know how and when to confront someone about an issue, sometimes it has to be right then and other time soon but never “later”. The word confrontation has a bad reputation. Everyone thinks it yelling and screaming. It should never be that. Its is a time to confront not hide. I like how you used the cowardice. A leader needs to be willing to step up and deal with issues not hide in a office. Thank you for this site it helps so much. My pleasure, Walt. And thank you for sharing your insights. So right! It doesn’t have to be a beat down. A little guidance with firm actions go along way. Dan: Good thoughts and advice. 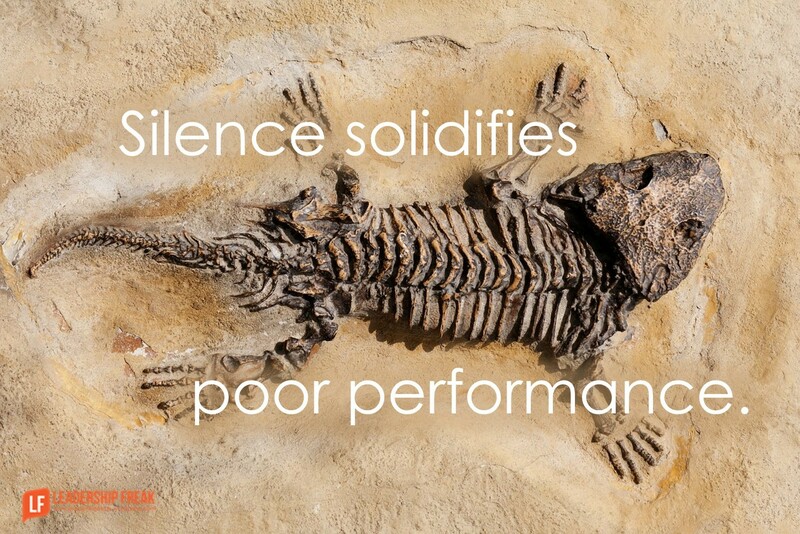 Way too many of us managers have gotten into the bad habit of being silent until there is a really big problem. I’m going to work on my action words rather than being a silent manager that tolerates ” a bucket of muck”. In the real world, we do get paid for what we do, whether it is with our hands or our head. In the other world of excuses, delays, incomplete work, and incompetence, folks are just marking time and probably irritating and annoying productive employees. Thanks Bill Sewell, COO, AIA, ASCE Sewell & Company Construction, Inc.